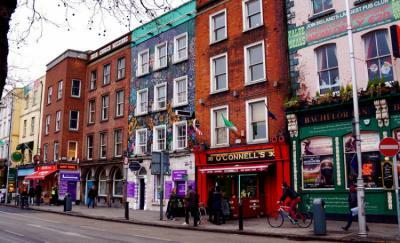 Dublin – Hostels close to City Center. Maps for Dublin, Photos and Reviews for each hostel in Dublin. Looking for a hostel in Dublin? Look no further, all the good deals in Dublin are on Dorms.com. Like thousands of other people every month, book your hostel securely at the best price in all neighbourhoods of Dublin. 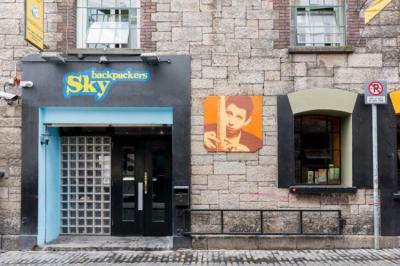 On this site, you can easily find a hostel downtown, in a trendy neighbourhood; a hostel in the student- university district, close to bus or train stations, airports or major attractions of Dublin. Christchurch Temple Bar St. Patrick's Cathedral Situated in the heart of Dublin city and right on the edge of the vibrant Temple Bar District, Kinlay House Hostel offers rooms close to Dublin's best selections of bars, cafes and restaurants and within walking distance to all the top attractions including the Guinness Storehouse, Grafton Street, Dublin Castle, Christ Church Cathedral, St Patrick's Cathedral, St Stephen's Green and Trinity College. We are based in Upper Gardiner Street, next to Mountjoy Park, a few mins walk from O'Connell Street, which is the main street of Dublin. You can reach us using Airlink bus 747 or Bus 700 which takes only 30 mins from Dublin Airport and stops nearby.) We are also near Busaras central bus station and Connolly train station. Also a short walk to the O2 and Croke Park, Dublin's legendary stadium. Restaurants, bars, shops, main tourist sights are all right here. Kinlay House is easy to find. 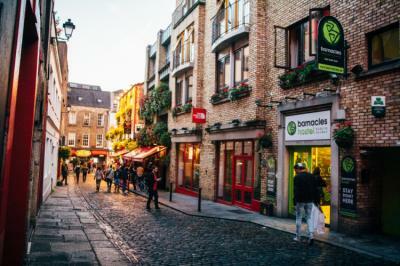 It is also very well placed as it is about 5 minutes walk from Temple Bar and not far from Dublin's Castle, Christchurch or Trinity College. The staff is welcoming, the decor is nice although a bit dated. We stayed in a street side room so quite noisy and too heated. In the morning we heard everyone going to the bathroom as our room was in front of the entrance. Lockers are available under beds that are comfortable. The price explains these small flats. The most disappointing thing is the pub crawl. We were sold this event attractively: 12 €, a pint offered in each pub, entry into the "disco" FREE and priority. Result: we learn at the first pub (Badbobs) that this offer was reserved for St. Patrick's Day and therefore completed. We had to pay our drinks in each pub in addition to 12 €. We would have done better to do the same pub tour because those visited were not extraordinary. We only made 3 and decided to come back as disappointing. The stay in the Kinlay lodge was quite bad, throughout the night (1 am, 2 a.m., 3 a.m., 4 a.m.) several groups of people entered the room making a lot of noise, shouting and turning on the light without no contemplation I had to cancel my stay for the second night, thus losing the money of the reservation and having to pay for a different room. We slept in a dormitory lacking curtains, with single glazed windows (while we are approaching the winter). The place was very poorly soundproofed. This dormitory was divided into "small rooms" of 4 people, but the lighting is common for each room. Thus, if someone wakes up early in the morning or returns late at night, if he turns on the light, he turns it on for all the small rooms. In addition, the mattresses and cushions are very uncomfortable. I did not have a good night at this property. In addition, the breakfast is not varied, there is no fruit, cheese or cold cuts. If you want to make sandwiches, we are entitled to industrial bread, butter, peanut butter and a single taste of jam. The staff is not particularly friendly, it does not take the time to discuss with the individual but only wants to go faster and more effective. Finally, no atmosphere is present in the place, the majority of travelers stay on their mobile phone the evening in the common room. Super cozy atmosphere, huge lounge with netflix on each TV. PC available with free printing. Clean, quiet, great breakfast included, check out 11am which is later than any hostel I could do. Safety at the top, staff at the top. An impression of being at home with meetings and more. Terrace with BBQ. I stayed with my bike in tho hostel for 2 nights just for sleep and no more. It's a good place for that. Thank you for your accommodation. Friendly as well as an informative explanation of the facilities; the rooms were clean and the ablution facilities were excellent. The food preparation facilities were the best I have ever used and the dining room was spacious and clean. Tea/coffee bay needed a bit of tidying up at times, but that was likely due to the residents not co operating by washing up their cups. The lounge/internet was comfortable and the outside deck was a bonus for socializing. Our stay here was wonderful! We stayed in the 16 bed dorm, so obviously there was noise from the other guests, but that can't be helped. The bathrooms were super clean and there were plenty of them. The staff is super friendly and helpful, there space to hang out is nice and the kitchen and breakfast were both great! Coffee, tea and hot chocolate available 24/7! The location is a bit away from the city center, maybe a 5-10 minute walk. Buts it was nice to be away from the noise. St. Stephen's Green Park St. Patrick's Cathedral Temple Bar Christchurch Dublinia The Guinness Storehouse is also easily accessible, as is Trinity College, Phoenix Park, Dublin Zoo and all of the many city centre theatres, galleries, restaurants and bars. If you’re booking for the festive period, we’re super-close to Dublin’s Christmas market too! When I made my reservation, I made the composition of the family of 9 people (6 adults 2 teenagers of 17 years old and one of 12 years old) and we had a dormitory of 10 beds At our arrival a hostess not too friendly tells us we can not accommodate another person in our room considering the age of the children which was not expected when I booked So she made me pay an extra 2 nights for the unoccupied bed either 40 € is this normal? For having spent 4 nights in this hostel, I do not recommend it. Rooms of 12 small with Spartan comfort, very bad soundproofing (get ready to hear techno all night even with earplugs), and the hotel staff is as cold as a fridge. Only positive point the location 2 steps from the city center So yes it's cheap but it's already too expensive for what it is. Hostel super well placed, very friendly and not expensive! Good location and clean. Breakfast is pretty standard stuff but cheap for 3euro - Dublin is pretty expensive for food othewise. Good location close to ha&apos;penny bridge. 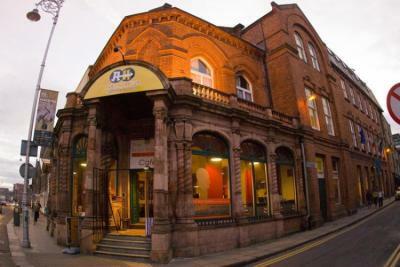 Located just off Dublin's famous O'Connell Bridge, we are the most centrally located hostel in the city. Temple Bar, Ireland's famous cultural corner and nightlife spot is a two-minute walk away and can be seen from the front windows. We're just minutes from all the major places of interest and shopping areas including Dublin Castle, Christchurch Cathedral, Trinity College, the Guinness Storehouse, Grafton Street and Stephens Green. 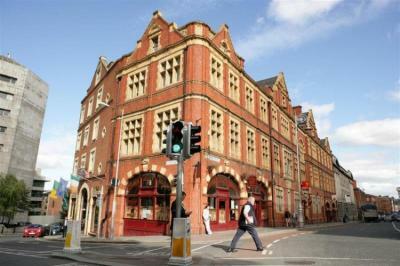 Isaacs is located in the Heart of the city on Dublin's Northside. The Bus station and Connolly Train Station and Luas (tram) stops are only a couple of minutes from here. The Arport bus stop is just around the corner. Major attractions such as Epic Museum , Jeannie johnston Famine ship and the GPO Museum are 5 minutes walk and it's only 12 minutes to Trinity College etc. Shops , bars and restaurants are all close by. Croke park and the 3 arena are also easily accessible. Very good hostel. Shower and toilet common by floor (6 showers and a toilet, which is more than enough). Quality breakfast for a hostel and good atmosphere. The decorations in the corridors are very beautiful (murals). Finally, the location is ideal, 300 m from temple bar. Everything is cheap, especially during the week. I recommend ! cold reception, noisy place because of the frequentations that day, very disturbed by the occupants during the night, turn on the lights at 2am, then at 4am when sleeping without any respect of those who slept, breakfast in the basement without air or opening on the outside except if smoker ... and bad quality. Too bad all other hostels in Dublin and Ireland were all there. Do not stay on this very bad impression. Great location, very good breakfast and cleanliness! 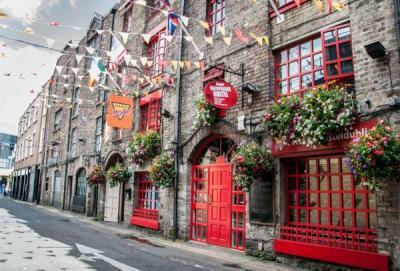 When you stay here you’ll only be a minutes’ walk from some of Dublin’s most famous attractions: Trinity College, Dublin Castle, Christchurch, the newly refurbished old Jameson Distillery or the amazing Guinness Storehouse. 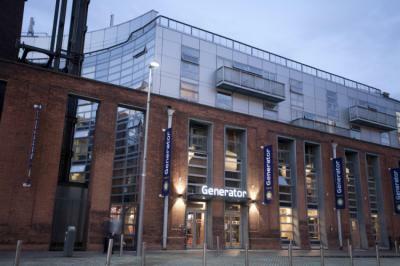 No hostels in Dublin offer quite the same experience as Generator, with all kinds of cool conveniences on-site. There’s a shop for all your travel needs, a cinema room where you can meet others and unwind, and it doesn’t stop there. The restaurant and café offers chic surroundings for locals and travellers enjoying choice picks from celebrated menus. Then there’s the Generator bar, renowned throughout the city for its great vibes, excellent beverages and popular events. Home top and lounge well equipped but tiny dorm despite the number of beds in it and showers / toilets not clean at all. The hostel is very well placed to be in the heart of the city without having too much transport to make to visit all the interesting places and monuments. The rooms of 4 are a little tight. The general condition of the hotel is a bit older, a good renovation would not be a bad thing. The kitchen has a lot of tables to find its place easily. Storing products in the fridge is a bit difficult. People tend to leave their dirty dishes in the sinks. But it is satisfactory overall for the price. Not too much contact with the staff. This hostel is super well located. We could do a lot of walking tours. The staff is really very friendly. So yes it's a little noisy but it is to be expected for a youth hostel at temple bar. Yet I had no problem sleeping! Small advice, invest in earplugs, it's magic! The focus was on the design of the lobby and bar. the wifi is of good quality. Very good. The rest is disappointing: unfriendly staff, loud music constantly in the lobby (to make young and trendy probably), noisy hostel (1 window of the room overlooked a patio occupied by people from the bar until late at night) , no hook in the room (where do we hang his clothes), locker under the bed for his business very difficult to access because the bed was in an angle, etc ... I recommend only for those who want to do the party ! Really kind staff, always there if you nees any help. Dormrooms clean and very well equipied. Sanitary very clean also and their amount is more than enough for all the people hosted there. My trip in Dublin was a success partly thanks to this hostel! Disappointed by the showers ... No bath mat and full of hair on the floor ... We must make the bed, it surprised me but it is not a problem.